Despite of being related to one of the most important abbey of XVII centrury, this square is currently a leftover in the urban fabric, with no connections to the other parts of the city and without a clear function within the urban structure. Our proposal aims to reintegrate the square into the urban fabric and its history, establishing a clear relation with the beautiful complex of Santa Maria Pia. 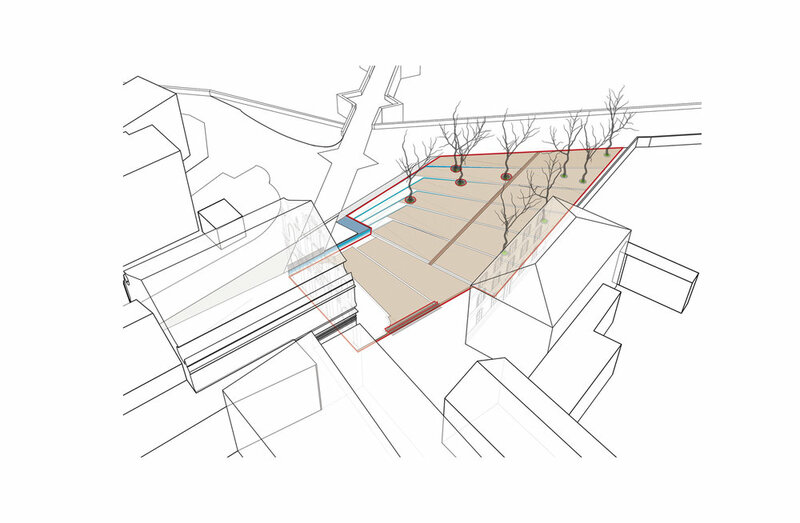 The project has been developed following three main guidelines: 1) minimize the interventions to the urban fabric mantaining the terrain conformation alongside the perimeter while keeping the plantation of trees in its original position; 2) define an essential and rigorous geometry to connect the surface in front of the abbey to the rest of the square; 3) create a clear hierarchy to clarify the two characters of the square: the civic one and the religious one. The result is the creation of a leaf-shaped urban landscape that opens to the city. A new colourful fountain bounds the square and at the same fades into it, defining a staircase towards the ancient axis of the bridge and penetrating in the flooring steps as if they lead the look toward the sea.